Second Edition Bharat Diamond Week Ended With Success note in Mumbai. The 3-day event was organized in premises of the Bharat Diamond Bourse (BDB) from 8th to 10th October 2018. The week was inaugurated by the chief guest Mr. Andrei Zhiltsov, Honorable Consul General of the Russian Federation in Mumbai and the Guest of Honour Mr. Evgeny Agureev, Director-United Selling Organization (PJSC Alrosa) along with the President of Bharat Diamond Bourse (BDB) Mr. Anoop Mehta, Vice President Mr. Mehul Shah and other dignitaries at the BDB Complex, Mumbai yesterday. While welcoming the exhibitors and buyers, Mr. Anoop Mehta announced that the yearly event henceforth will be held twice every year with its 3rd edition from 1st to 3rd April 2019 and 4th edition from 14 to 16 October 2019. He thought that it is imperative to get world buyers visiting and networking in India, as 80 percent of diamonds are cut and polished here. Mehta also expressed hope that Russia will open up its consumer sector for Indian jewellery, while India will, in turn, use Russia’s rough diamonds. The three-day event, which saw the participation of 120 companies dealing in polished diamonds, with large participation from Small and Medium Enterprises, was inaugurated on Monday by Andrei Zhiltsov, Consul General of the Russian Federation in Mumbai, and Evgeny Agureev, Director of ALROSA’s United Selling Organisation. Agureev also congratulated the BDB on holding its second polished diamond fair: “We have an excellent relationship with the Indian diamond market which accounts for 52% of our sales of rough diamonds,” he commented. 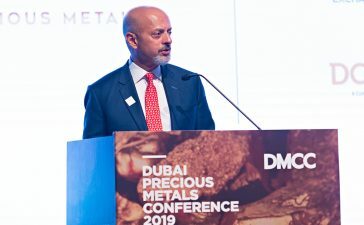 BDB Vice President Mehul Shah, who is responsible for the Bharat Diamond Week project, said that once a stranger enters the BDB, he is no longer a stranger but a member of the BDB family. Looking at present business scenario I can say exhibition was good there where very less expectation looking at other sources but it was much more than we expected and buyers happy yes they were inside the exhibition area but many where moving around BDB complex and then I was hearing from all members that all the buyer got quite a good amount of goods it it’s a positive sign and all exhibitors are happy infrastructure was very good and thanks to our Russian friend Mr. Evgeny Agureev director of alrosa And The council general of Russia in Mumbai that day grace the opening ceremony of the Bharat Diamond week edition and we are waiting and looking next date in April 1 to 3 2019 at next Bharat Diamond week “The Bharat Diamond Week was created to uplift the lower and middle segment of the diamond business, and we are committed to strengthening the SME sector,” he added. In conjunction with the main event, there was also a special display of synthetic diamond detection machines as well as on-site facilities for checking diamonds created using the Chemical Vapor Deposition (CVD) method.